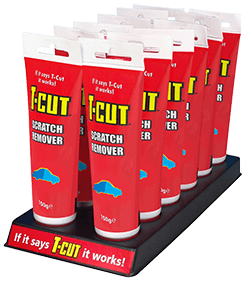 T-Cut Color Fast Scratch Remover (patent pending formula) removes scratches, scuffs, blemishes, and adds colour in one easy application. 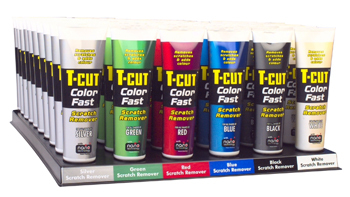 T-Cut is enhanced by nanotechnology, making it easier to remove light scratches and mask, deeper scratches. The coloured pigments blend in with all shades of paintwork, cleaning and removing oxidation, creating a flawless colour-matched finish. Available in Original, Black, White, Silver, Red, Blue and Green. If it says T-Cut it works!